Above, an image of pneumonia (lung inflammation) caused by the measles virus. New York is in the midst of an outbreak of measles, a childhood disease that shouldn’t really exist in the U.S. any longer. On Tuesday, NBC News reported, New York health officials said the state has seen more than 100 cases of the vaccine-preventable disease since last September—a tally not seen in decades. The majority of these cases have happened among the unvaccinated. Measles is a highly infectious disease that can be spread with a simple cough or sneeze. Its flu-like symptoms are usually followed by a distinctive, splotchy red rash that runs down from head to feet. And though most people recover without incident after a week’s time, measles can rarely cause more serious complications like hearing loss, permanent brain damage, and even death. These risks are more likely in the very young; measles can also cause birth problems in children whose mothers contract it while pregnant. Luckily, we’ve had a vaccine against measles since the 1960s. And thanks to a mandatory childhood vaccination program, the disease was declared eradicated in the U.S. in 2000, meaning there are no natural reservoirs in the country from where the disease can sprout up again. The danger of measles isn’t gone, though, since travelers can bring the disease over from elsewhere. And the virus can still spread among young children who haven’t received a full course of the vaccine (currently, children are vaccinated for measles, mumps, and rubella via two shots of a single vaccine), as well as among those who choose not to have themselves or their children vaccinated at all. The latter scenario is what seems to be happening in New York. During the current outbreak, there have been at least 55 confirmed cases in Brooklyn, along with 105 cases in Rockland County, just outside New York City. 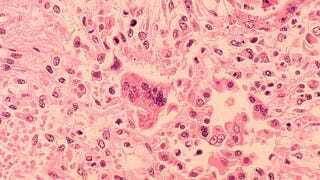 These cases have primarily affected Orthodox Jewish people, and it’s likely the outbreak began when unvaccinated individuals brought it back from Israel, which itself is dealing with a measles outbreak currently. Recent smaller outbreaks of measles in New York have been concentrated in these communities too. In New York, as well as in 46 other states, families are allowed to exempt their children entering private and public schools and daycares from taking vaccines if they have religious objections. But it’s a bit unclear to what extent religion is playing a major part in these outbreaks. Orthodox Jews, as a whole, do not shun vaccination. But there are smaller groups within the community that have bought into the anti-vaccination movement. And it appears that anti-vaccination groups, such as PEACH, or Parents Teaching and Advocating for Children’s Health, have purposefully stoked fears of vaccination in these communities, often spreading their message through ultra-Orthodox rabbis or via pamphlets and robo-calls, according to NBC News. “It is amazing how much resources and funding they have,” Zucker said of PEACH and similar groups, according to NBC News. Antivaxxers aren’t the only reason for the outbreak—lax enforcement of vaccine restrictions on the part of private schools has also played a role. While the state’s overall vaccination rate is 92 percent, for instance, some schools in Rockland Country have reported rates as low as 50 percent for their enrolled children, according to NBC News. Health officials have scrambled to prevent the outbreak from getting larger. Sick children have been told to stay home, poorly vaccinated schools and daycare centers have been closed, and even a Hasidic wedding with a sick groom was shut down over the holidays. Families in the affected areas are also being encouraged to vaccinate their children earlier, rather than wait until age 4 to complete the full round of the vaccine.